We'll post below specific information topics which we think you will find helpful. If you would like to suggest topics for inclusion contact us. Prior to taking delivery of the B4RN Hyperfast broadband service there are several things that you should ensure have been done. Not everything mentioned here will apply to you, but it's worth reading through to find out what does. Check who provides your current email addresses, websites, domain names, telephone services, Red Care lines, etc. Identify where the new B4RN router will be located and be sure you have prepared things ready for the move to B4RN services. Go through the following to help yourself assess the impact and things you may need to do before you end your current services. Any services provided that utilise the standard landline infrastructure will be affected. This is a greater range of services than you might at first think. Many people use free email services provided by Microsoft, Google, Facebook, Apple and so on and they should not be affected. Anything that is from your current internet provider, e.g. BT, Sky, TalkTalk, EE, Plus Net etc, will be. The bigger impact is that anything you have subscribed to that uses those email addresses will need to be updated to your new email addresses once you have acquired them, so set up new email addresses well in advance of terminating your current internet provision. Remember, many organisations use your email address to send you the instructions on how to unlock your account if you've forgotten the password so having a working email address is vital. Key Question: Which organisation is currently providing my email? If you have a website is it hosted by your current provider? If so then it may also be lost if you move to B4RN. Again, as with email, make sure you migrate your account details before you leave the old provider. Key Question: Where is my website currently hosted? Home phone numbers need to be moved to a different provider such as Vonage (there are others) before ending your landline service. If you plan to keep an ordinary landline phone then this is not something you need worry about. 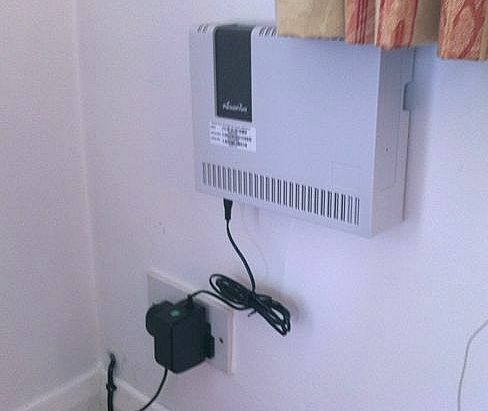 You should also remember that services such as Redcare require a standard, wired landline. Key Question: Who provides my current landline phone service? BT TV packages such as BT Sport are more problematic. Without BT broadband the only way you can get BT Sport is via SKY. As a non BT broadband customer this will cost around £20 per month in addition to your SKY subscription. Key Question: Do I currently use BT Sport and how is it delivered? As with BT Sport many service providers offer packaged bundles as part of their service subscription. This might include antivirus, parental controls and cloud storage as well as email addresses and personal websites. If any of these are provided by your current ISP you will need to acquire them individually elsewhere. Also remember to transfer anything you have in their cloud storage to another location before moving providers. Independent cloud storage is not affected but remember the password and email address issue mentioned above. Key Question: Are there important services bundled by my current internet service provider that I'll need to replace? Assess what you are going to connect to the B4RN service: computers, tablets, e-book readers, SMART TVs, internet phones, internet radios, security cameras, games consoles, WiFi printers, mobile phone signal boxes, etc. If you have any of these devices identify whether they are connected by Ethernet or Wi-Fi. If you require more than four Ethernet connections you will need to install an Ethernet switch, possibly situated away from the B4RN router (e.g. in another part of the house) and connected to it by a cable. To get the best out of the B4RN service make sure you use cat5e or cat6 cables. If you require many Wi-Fi connections or need to distribute Wi-Fi around your house you may need additional Wi-Fi Access Points. The issues surrounding extending connectivity by ethernet or Wi-Fi will vary enormously depending on your proposed internet usage and the characteristics of your property. A good starting point for finding out more is the B4RN document called Home Network Help which can be downloaded here and you are also welcome to ask us for personal guidance by contacting us. Remember that the broadband connection used to be the slowest part of using the internet. With B4RN this is not likely to be the case anymore. Poorly or wrongly configured devices can have a greater impact on speed. All the elements can be optimised to ensure you get the maximum from the 1Gb service, but may require some additional outlay. Decide on your needs and know that whatever they are the broadband connection is no longer the limiting factor. Contact a team leader if you need to talk about anything, we are sure to be able to help somehow. So then, you have decided to join the community of Hyperfast broadband users, and now you are wondering where you are going to put what must be a rather large router to deliver that much speed! Well the B4RN router is about the size of 2 BT Home Hub 2's fused together (or a cereal box). It's pretty basic in appearance, just a plain white box mounted a little proud of its backplate with a few flashing lights and cables plugging into the bottom of the unit. Just like the phone line from BT, the point where the B4RN connection enters the property will be fixed and once there, it stays there. You get to choose where on the ground floor of your property you would like the router to be located. If you've chosen not to take the service immediately just a similarly sized base plate will be fitted. There are some constraints due to the characteristics of fibre, but generally the router can be sited in the most convenient place. The router is a premium piece of equipment, as are the couplings and filters. For installation you could seek advice and pay someone to do the work, or even find a volunteer to do the work. When identifying where to site the B4RN router you should consider the following: it needs to be no further than 1.5 m from a power socket, how will it look in your room, air circulation (not too much or too little), whether all the devices that need a wired connection can reach it and what the Wi-Fi coverage will be like. As most people won't know much about the last two, that is where the local team can help if needed. There are several great DIY articles on the B4RN website and also individuals, small businesses and companies locally and nationally that can help with all aspects of high speed home and business networks. Keeping it really simple, and on the premise that your current broadband router site works for you, just see if the fibre can be routed to the same location and pick a convenient spot on the wall. All of the connectivity within the home or business is the responsibility of the householder; just as it is with other providers. Once you have identified and agreed the best location for your router, the appropriate length of ducting can be provided to bring the fibre from the property boundary to your house wall. Digging the land within the property boundary is something to be arranged between you and the community. I am sure that with a cooperative effort many installations can be done with community support. For those more challenging ones there are many local gardeners who would be happy to quote for the work. As the network approaches your location you will need to contact an area leader to discuss whether you'd like to have a connection into your property. If you do you will be asked to complete a simple form requesting the connection from B4RN, which involves a one-off connection fee of £150 (waived if you have invested at least £1500). At the same time you will be asked to say where you will want the router located (or just the baseplate if you do not intend to take the full service immediately) which determines where the fibre duct needs to be brought into your property. You will also need to indicate the route you plan to use between the boundary and your property so that an appropriate length of duct can be left at your property boundary for the connection. Deciding on the location of the router is therefore a crucial step and ideally needs to be thought about before these discussions happen (see the FAQ “B4RN Fibre Router Installation”), but if you need help you'll be put in touch with an expert member of the team. Once the duct has been left at your boundary it is up to you to get it from there to the agreed entry point at your property (the actual installation can then be done by experts from the team at a later stage). This typically involves digging a shallow trench, removing any sharp stones which might damage the duct, carefully unwinding the coil of duct left at the boundary, laying it into the trench and covering over. Many householders will see this as a simple gardening job but others will find the prospect daunting, especially if the route from boundary to property involves having to negotiate difficult terrain or if there are serious obstacles (such as walls, concreted areas etc.). Once again local volunteers are there to help, both with the planning and even the execution of the work. You may have to use the services of a professional gardener or landscaper. 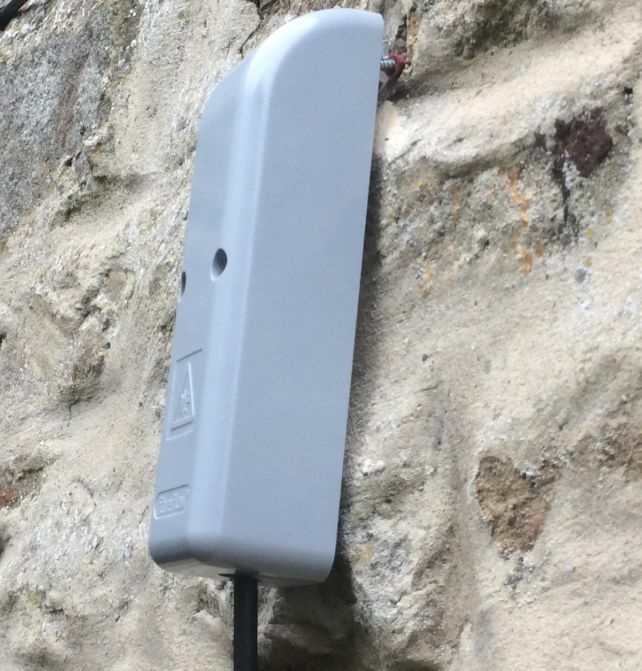 With a little help from neighbours and perhaps neighbouring volunteers, getting the duct from the boundary to your property is often a lot simpler than it might seem at first sight and, as B4RN projects have progressed, techniques for making it even simpler have evolved. Pragmatically, any method which delivers an undamaged duct (sealed at the leading edge and with no tears or kinks) from the property boundary to the property is fine. Orange duct needs to be protected from sunlight (which degrades it) which is why it is buried, but, as long as it is safe from future disturbance, the depth of a trench can be quite shallow. Protecting the buried duct from possible damage by sharp stones is perhaps the main hazard and is the fiddly part of constructing trenches (removing stones, filling in with soft material, etc.) but increasingly householders are finding that a much simpler approach is to use a tough protective sleeve for the duct to feed through (alkathene water pipe is ideal) and lay that along the route first. Putting in a tough alkathene pipe requires simply digging a minimal trench, dropping in the pipe and covering over (usually with the material previously removed or even just moved to one side). Sometimes bringing the duct into a property can be more complicated, perhaps involving taking an exposed route over the surface of structures, but again, advice and assistance should be available from neighbouring volunteers in most cases. Important! Be sure to record details of the route you have adopted. Once ground has settled and grass grown over it will be difficult if not impossible to know where the duct has been laid. Draw an accurate plan of where the duct has been laid, make notes about any special features (e.g. its colour if you have used some kind of protective sleeve), take photographs and keep them safe. B4RN recommend keeping those records with your property deeds and also letting them have a copy. The operational model underpinning Broadband for the Rural North (B4RN) combines community endeavour with a non-profit professional contribution to build hyperfast fibre broadband networks at a fraction of the cost of a purely commercial approach. Even so, materials and some labour costs have to be paid for, so every B4RN community project has a financial component. The finances for a project fall into two categories, the core build element and the local element. The core build is the main infrastructure for a network, comprising the ducting and chambers which distribute the network throughout the community, the main control cabinet and the optical fibre itself. In addition, although voluntary and local low-cost labour are used wherever possible, some technical or complex build work will require the use of professional contractors. When a project is first assessed, B4RN estimates the core costs on the basis of the proposed route map for the network and experience of previous projects and sets that as a financial target for the relevant community. B4RN pays directly for the core build from capital resources and the community's obligation is to contribute to those resources by investing in B4RN via shares or loans to a level equivalent to the set target. Although every B4RN project is run by local volunteers, there will inevitably be costs involved in managing and implementing a project. These costs form the local element. At the most mundane level, there will be routine administrative costs such as printing, transportation, telecomms. and so on, and the work of volunteer build-teams will need to be supported by tools and equipment purchased at the local level. The estimate for the five areas is £500,000 to £600,000. Enough has already been raised to start the work but much more investment is needed to complete the task. So please consider investing after reading the information below. B4RN have two basic schemes for investment, through share purchases and through loans to the company. In simple terms, each share has a nominal value of £1 and can only ever be sold back to B4RN for £1 (after having been held for four years), but the sweetener is that, because B4RN is an Enterprise Initiative Scheme company, tax payers can claim back from HMRC 30% of the value of their investment, effectively reducing the cost of every £100 worth of shares to £70. In addition, after shares have been held for three years, they start earning interest (currently 5%) paid annually as additional shares and for every £1,500 of investment a subscriber is entitled to a free B4RN fibre installation (saving £150). The B4RN loan investment scheme comprises two options, five or ten year term investments currently earning 5% per annum. For the ten year scheme it is possible to negotiate a draw-down arrangement so that the investment can be used to generate an income stream. In either case, as long as the investor made it clear at the application stage that they wanted their investment to be associated with their area Project then their investment would count towards the individuals area target. If you would like to invest in B4RN shares then download an application form. You have to apply using the paper form, but you can pay for the shares by BACS. The bank details are on the form and you can use your surname+01 as the reference 'number' (no need to contact B4RN as it suggests on the form). The minimum investment is £100 and the maximum £100,000. If you are attracted to the loan option then you have to deal directly with B4RN. Give them a call on 01524 555887 and ask for details of the loan scheme. Either way, if you decide to invest, just remember to tick the 'designated for a specific area' box on the form and write in Killington, Firbank, Marthwaite and Howgill, Cautley or Sedbergh. Your local project is run by a team of volunteers who run a fund to cover local costs. Each has an efficient management group and any contributions to an area's local fund will be very useful and much appreciated. Many thanks to all those who have helped the project with any kind of financial contribution. As more and more of our target population have been connected and are using the B4RN service, the installation and follow-up teams have gathered some impressions about new users' experiences and it is becoming clear that there is still a certain amount of confusion about various aspects of what might be involved in making the switch to B4RN. This website has already covered many of these topics, but perhaps it is time to go over some of these issues again. Just what is B4RN broadband and how does it differ from the ordinary variety? B4RN broadband uses one of the fastest and most reliable ways of bringing internet connectivity into your home, by using optical fibres all the way to the router (which provides your local connectivity interface for all the devices you want to use), a system known as 'Fibre to the Premises' or FTTP. Conventional broadband relies on using telephone wiring from the nearest telephone exchange (the original method) or a combination of optical fibre to a local cabinet in a community with telephone wiring completing the connection, known as 'Fibre to the Cabinet' or FTTC. The usual method of measuring broadband performance is the speed that data can be transferred, in units of 'bits per second' (bps). These 'bits' are pretty tiny, so more usually the units quoted are a thousand (kilo), a million (mega) or a thousand million (giga) bits (kbps, mbps and gbps respectively). B4RN performance is nominally 1000 mbps (1gbps) compared with a theoretical top speed of 100 mbps through normal FTTC systems (such as the Openreach one in Sedbergh used by BT and all other ISPs). In practice top FTTC speeds rarely exceed 80 mbps. An advantage of FTTP is that performance is not affected significantly by distance. B4RN performance is the same for all customers. With FTTC the use of telephone wiring to complete the connection from the cabinet introduces distance-related performance losses. At 150m from the cabinet the maximum theoretical performance will drop to 80 mbps and at 300 m to 45 mbps. At about 1.6 km FTTC is no better than ordinary broadband (10 mbps max dropping off dramatically for longer distances). All these being theoretical speeds when actual speeds are often much lower. B4RN broadband is also 'symmetrical' which means that the performance moving data to the internet from your router (the 'up' speed) is the same as getting data from the internet (the 'down' speed). With ordinary broadband (including FTTC) the 'up' speed is always very much less than 'down' (e.g where the 'down' speed is 25 mbps the 'up' speed is less than 5 mbps). If B4RN broadband is so much better, surely everyone will want it? Not necessarily. People on FTTC situated close to the cabinet will have very good broadband, probably completely adequate for their current needs. As long as they have installed the B4RN optical connection and had a backplate fitted while they can under the preferential terms of the community project (a no-brainer for any property owner) they have effectively future-proofed their options if their needs change (streaming HD video was science-fiction just a few years ago, perhaps next year we'll all be streaming 4K). Even many people at the limit of FTTC effectiveness (or those still using non-fibre broadband with a decent performance) might feel that their present arrangement serves them perfectly well, particularly if they value any bundled services from their current provider. Conversely, it is hard to see how anyone with very poorly performing broadband wouldn't gain some benefit from switching to B4RN. Between those extremes you have to weigh up the pros and cons. Even if you have well-performing broadband you could see big advantages in switching, particularly if you are a heavy internet user moving lots of data around or have many people in your household trying to do data-intensive things at the same time causing occasional (or frequent) problems. As we've tried to stress before, B4RN speed as a performance measure is more to do with the capacity to do things than how fast a single transaction takes place. For most people the asymmetrical nature of ordinary broadband is not a problem. When you're web surfing, streaming video or listening to music online, for example, most of the traffic is 'down'. But for those who need to move large data files from their own devices to others over the internet or want to live-stream high definition video from a webcam or a smartphone, the symmetrical nature of B4RN will prove to be a game-changer. Not necessarily. The B4RN service to your router is world class and capable of working at pretty much the highest speeds you'll presently come across, but the actual speed you experience will be moderated by many factors. Entirely outside your (or B4RN's) control, the various machines your internet connections pass through to get from you to the remote system you are accessing (e.g. a web page) will all have their own performance characteristics. For example, a connection to the Amazon U.K. website involves going through a chain of about 20 machines, any one of which could represent a 'pinch point'. Within your own local network (all the connections inside your property to the B4RN router) every connection point, connected device and software inside devices will have implications for performance. Many tablets and smartphones cannot connect at higher than 150 mbps (and some much less). Many smart TVs connect at 100 mbps even when plugged directly into one of the LAN ports on your router (the most efficient connection method). If your present ordinary broadband service is the limiting factor then you will definitely see immediate improvements when switching to B4RN, otherwise the improvements will be more subtle: things still working when lots of people use the system at once; the ability to move large data files in a fraction of the previous time (assuming you have a modern device connected appropriately); the ability to do things you never could before (such as high quality live video streaming). A good analogy is water pressure. In a house with low water pressure you can use any one tap without problems but try using several at once and each one will hardly flow at all. Forget about speed per se and think of B4RN as giving you more internet 'pressure' than you'll probably ever need. We've talked about plugging a device (such as a laptop) directly into the router for the best, trouble-free performance, but the fact is most people will want to use Wi-Fi to distribute the internet around their homes. This is an area where some new users of B4RN have experienced frustrations. 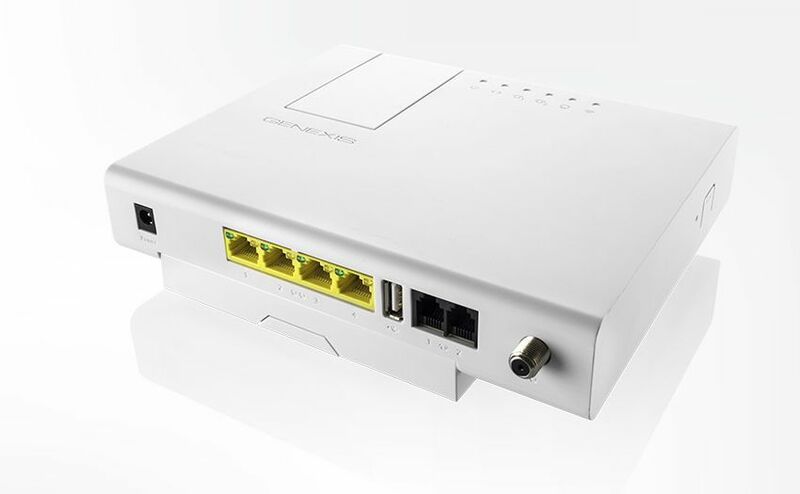 The B4RN router is technically extremely effective having four gigabit LAN ports and built-in Wi-Fi which can work to the highest modern standards at very high speeds but it is designed as a cost-effective solution to work well in the average sized, compact houses of modern construction typically found in continental Europe, particularly Scandinavia. Unfortunately many houses in Sedbergh and the surrounding area are built of stone, often with walls several feet thick, or are rambling and far from compact. Both of these features are unhelpful when it comes to propagating a radio signal. The Wi-Fi in the B4RN router is a little less powerful than the most recent routers supplied by BT so has slightly less range. Some people who have switched have found that spots in their houses where the BT router just about worked no longer work with the B4RN router. Coming across this kind of issue when it is unexpected is annoying, which is why we're talking about it now. If you have yet to decide whether to take the B4RN service it's better to be forewarned and recognise that if the Wi-Fi coverage isn't quite as good as you have at present you might need to spend a little money to optimise your system. The good news is that all Wi-Fi connectivity problems are solvable and often with very little outlay. Using one or two Wi-Fi 'extenders' is typically all that's needed and there is plenty of information available about their use - the Resources section of the B4RN website and the internet generally! Also anyone who feels they need help with this only has to contact B4RN Customer Services or an area leader who will be happy to help if they can. There is no 'one size fits all' solution to Wi-Fi problems, but in those cases where coverage seemed alright before but is now 'patchy' we would recommend considering the approach where a powerful, high-performance wireless access point (extender) is located as centrally as possible in the area of a property where you want Wi-Fi coverage. The access point is then connected to the B4RN router by a Cat6 LAN cable and configured according to the manufacturer's instructions. Finally the internal B4RN router Wi-Fi should be disabled (via the router's administration web page) to avoid connection conflicts. As installed, the B4RN router works just fine for most people, so why have a FAQ about changing its configuration? The fact that the configuration can be changed is the main reason. In its default state the configuration utility is protected by a generic password which is commonly known, so that anyone connected to your local B4RN network could access the utility and make their own changes to your system, including some which could compromise its security. For a domestic set-up this possibly poses little risk (as long as you trust all your users), but for any B4RN system being used in a quasi-public setting (café, pub, village hall, church etc.) where casual users are allowed Wi-Fi access, protecting the configuration utility is a must. We would say that, for the sake of the small amount of effort involved, changing the configuration password is probably sensible for every B4RN system. The configuration utility is accessed through a web page (provided by the router itself) so you access the page using a web browser (Internet Explorer, Safari, Edge, Firefox, Google Chrome, etc.) from any suitable device connected to your network. (N.B. Section 5 of the Quick Installation Guide which came with your router also deals with configuration but the web address they give you there is not correct). Now all you have to do is put admin in 'Current Password:' field and your new password in the 'New Password:' field, repeated in the confirmation field. Click 'Save Password' to make the change. If successful you'll be presented with a new authentication request to log back into the configuration page ('User Name: admin' along with your new password) and you're done. Your new password has to comply with some basic rules. The password must be at least five characters long , not contain any spaces and use the letters A-Z,a-z and numerals 0-9 (passwords are case-sensitive). The router will give you an error message if your password is unacceptable or if the new password and confirmation fields do not match. Make sure you remember your new password! There are many router characteristics which can be changed through the configuration page, but we're not going to discuss them all. Some, such as 'port forwarding' and setting up a 'Demilitarised Zone' (DMZ) are advanced features which have potential impacts on the security of your network. If you understand why you might want to configure any of the more exotic aspects of the router you certainly don't need this guide! However, there are one or two things which the more adventurous 'average' user might want to investigate. First, though, a couple of important points. If any of the changes you make have seriously deleterious results, you can always restore the router to its 'factory' default settings by using the reset button described in the Quick Installation Guide (located inside the small hole underneath the WPS button on the right side of the router). Press the reset button for more than 5 seconds for a complete factory reset (remember this will also restore the default login password). Do not make any changes to the wireless configuration from a device connected by wireless as you are likely to lose connectivity in the process. Always adjust wireless settings from a computer connected directly to the router through one of the LAN ports. Some of the router configuration options simply provide information. Specifically, the 'Status' main menu option (second line in the dark blue header section) has several potentially interesting sub-sections. The 'Status' landing page is 'Interfaces' which shows statistics for the router's physical interfaces. Of the other options both 'CATV' and 'VoIP' have no meaning in the B4RN environment but 'DHCP Clients' and 'WLAN Survey' can be useful. 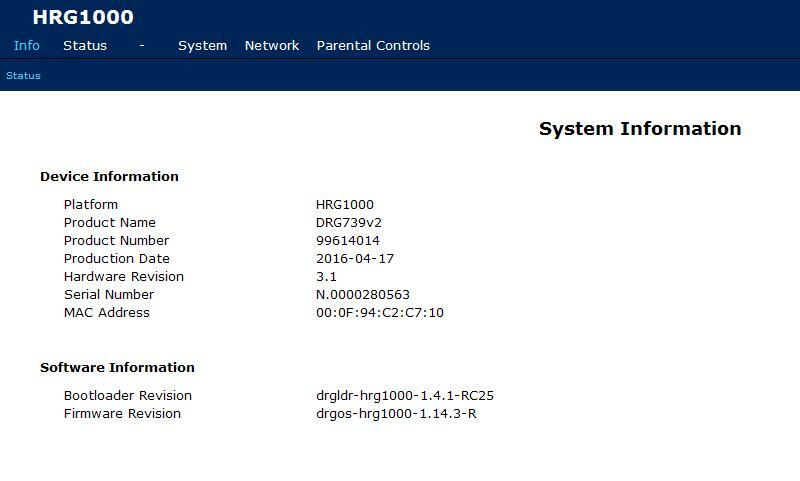 DHCP Clients - shows details about the devices connected to the router (called DHCP Leases in router-speak). In this case there is just one device, my own computer carrying out these tests called Blackbird. A useful piece of information from this screen is the 'MAC Address' which uniquely identifies the relevant device. MAC addresses are often used when making configuration changes specific to particular devices. WLAN Survey - This option scans for wireless networks within range and shows information about them. The B4RN router is shown at the bottom with other visible networks (or technically the access points to those networks) listed above - just one in this case. This list is potentially useful if you believe there might be potential conflicts between your B4RN router's Wi-Fi settings and networks close to you. It should show you which channel numbers to avoid. The 'Network' main menu option contains the bulk of the configuration choices. Many of these imply technical knowledge, so do not change anything unless you know what you're doing! The following options might be of interest to average users with some technical awareness. 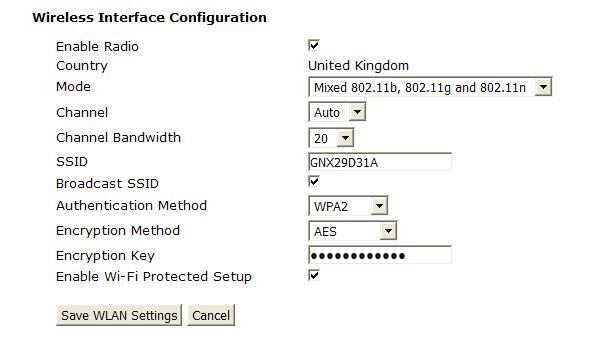 Wireless - This is configures the 2.4GHz (standard Wi-Fi) interface. Useful choices here are likely to be disabling the interface (e.g. if you are using an alternative Wi-Fi access point), changing the SSID (if you prefer something less cryptic than the default), changing the channel (if you suspect conflicts with other networks), changing the Encryption Key (if you want something more memorable than the key given on the router label), turning off WPS (Wi-Fi Protected Setup) if it's not needed. When you've finished making changes click on 'Save WLAN Settings'. NB - Many of these changes will require all Wi-Fi connected devices to be reconnected. Do not make changes lightly! Wireless 5GHz - Similar to the previous entry, but for the more advanced Wi-Fi interface. WLAN Access - Allows you to restrict or deny device access to Wi-Fi by means of a list of MAC addresses. This could be useful in a setting (such as a club) where a large pool of potential users exists but where you don't want to accommodate allcomers. UPnP - If you know that some part of your system requires UPnP (Universal Plug and Play) at the router this is where you can turn it on, but it represents a security risk so is off by default. The router has some (fairly crude) ways of controlling use by time of day. There are two sections, 'Timed Access' and 'WLAN Control'. Timed Access - Allows you define days of the week and times of day when a particular device is blocked from using the internet. This is done by creating rules called 'sessions' which define the restriction parameters. These 'sessions' are stored by the router and can be activated or deactivated as desired. Setting up a 'session' requires that the target device is currently connected. The device can then be selected from a drop-down list. You could use this kind of approach to prevent a child's smartphone or tablet from accessing the internet during the night, for example. WLAN Control - This lets you set up blocks of time (once again called 'sessions') when Wi-Fi is completely disabled. This could be useful in public settings (such as a church or club) where it might be desirable to prohibit Wi-Fi access 'out of hours'. Although not specified exactly for the current B4RN router version, you can get a detailed manual here. In the spirit of encouraging rural enterprise, B4RN has a special service rate (£15/month) for holiday lets. The intention is to encourage owners of properties which they rent out to install quality broadband and hence make them more attractive to visitors to the area. This in turn generates an increase in economic activity and is good for the community. The scheme is specifically focused on properties which are let furnished primarily for offering holiday accommodation and on a commercial basis. Properties used as holiday homes by their owners and not intended primarily as a commercial let are not offered any special pricing. The fact that they may be occupied for less than 26 weeks is not relevant in deciding whether they get the reduced rate. The precise basis for deciding whether a property would qualify is determined by some arcane HMRC rules laid out in the document Furnished Holiday Lettings. If you can tick all the boxes then almost certainly you could take advantage of this useful concession.